What is another word for disposal? 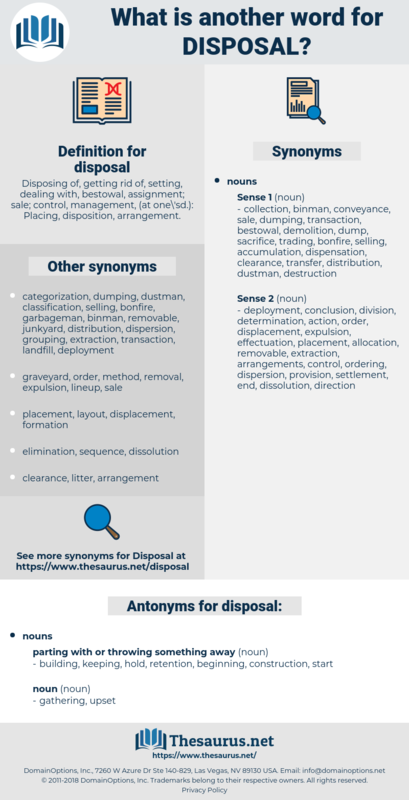 Disposing of, getting rid of, setting, dealing with, bestowal, assignment; sale; control, management, ( at one\'sd. ): Placing, disposition, arrangement. destruction, phasing-out, removal, washout, Liquidating, rid, processed. individuals, disposition, dispositions, residues, sites, champions, uses, plans, outlets, waivers, Persons, elimination, Heroes, venues, destruction, eradication, removal, removals, evacuation, evacuations, alienation, phase-out, provision, liquidation, landfill, landfills, divestiture. men, disposition, landfilling, neutralization, elimination, possession, discontinuation, willingness, destruction, spillage, neutralisation, phasing-out, submersion, eradication, removal, dismantlement, dismantling, stipulation, evacuation, cession, deposition, alienation, warehousing, utilization, recycling, dispossession, provision, liquidation, reprocessing, circumvention, disappearance, Placing, landfill, divestiture, provides, Divestment, disqualification. Dealt, Tackled, Approached, covered, processed. building, keeping, hold, retention, beginning, construction, start. But very early in the morning I will see Marie - Louise, and by the time mademoiselle and her father have had breakfast the house will be at their disposal." " I leave the criminal at the disposal of your worship," he said, and went out with his clerk.